Olympus Mons - Largest Volcano In Solar System !!! | Do You Know? Olympus Mons - Largest Volcano In Solar System !!! The largest known volcano in our solar system OLYMPUS MONS on the planet Mars. At a height of almost 22 km it is roughly three times as tall as Mount Everest and is the also tallest known mountain in the Solar System.. Olympus Mons had been known to astronomers since the late 19th century as the albedo feature Nix Olympica.With a diameter of more than 500 km and a summit that towers 25 km over the surrounding plains, its volume is over 100 times that of Mauna Loa in Hawaii. 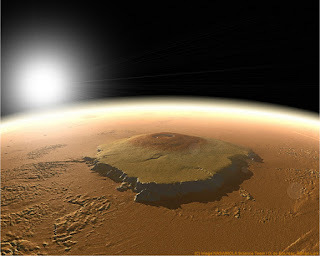 Awesome View Of Olympus Mons !!! Olympus Mons is the youngest of the large volcanoes on Mars, having formed during Mars' Amazonian Period. 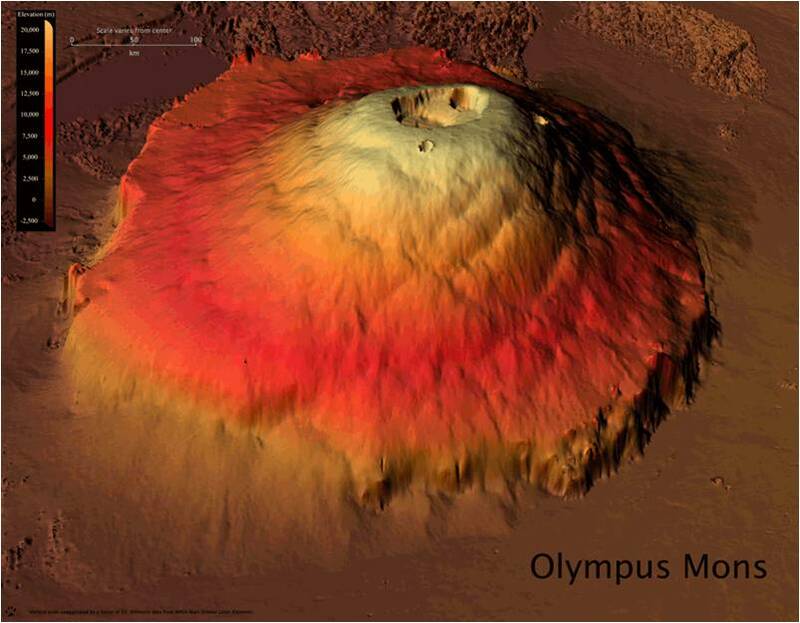 Olympus Mons is the result of many thousands of highly fluid, basaltic lava flows that poured from volcanic vents over a long period of time. Compared to other areas on Mars, there are very few craters on its slopes, indicating that it is geologically very young. Many of the volcanoes on Mars show significant cratering, indicating that they ceased activity a billion years or more ago. By contrast, Olympus Mons is presumed to be less than 100 million years old. Olympus Mons is a shield volcano. Rather than violently spewing molten material, shield volcanoes are created by lava slowly flowing down their sides. As a result, the mountain has a low, squat appearance, with an average slope of only 5 percent. Why would such a huge volcano form on Mars but not on Earth? Scientists think that the lower surface gravity of the red planet, combined with higher eruption rates, allowed for the lava on Mars to pile up higher. The presence and absence of tectonic plates could also play an important role in the different kinds of volcanoes. The hot spots of lava under the crust remain in the same location on both planets. On Earth, however, the movement of the crust prevents the steady buildup of lava. The Hawaiian Islands, for instance, formed as a plate drifted over a hot spot. Each eruption created a small island in a different spot.